Having your own social security number is necessary to be able to live peacefully and legitimately in the United States. Filing your Social Security Card Application Online often makes the most sense. A social security number is also a requirement for a number of different things like when you apply for a job or a credit card. You may also come across employers that would require you to include it in your resume for security purposes. However, not everyone has an SSN and it could be because of many reasons. >>> Get your Social Security Card online today! There are a lot of documents that you need to acquire before you can apply for a social security number and all of them should not be photocopies. All these documents have to be authentic. If you need the original card or you have not been given a number before, you have to inform the agency your identity, citizenship or alien status (lawful), and current age. You may also need another copy of your card for whatever reason. In this case, any identification proof must be presented. If you have been born outside the country, you still have to present a proof of your lawful alien status or citizenship. If you are a newly-wed or you just got divorced and you need your name on your social security number to be updated, you need documents that would support your claim like proof of identification containing your old name. It also must be the same with the aforementioned citizenship status proof. For a proof of age, you are required to present your birth certificate. Further credentials may suffice like religious records that were released before you reach three months old like a baptismal certificate, or hospital records until you were the age of five. For a proof of identity, you can choose from these accepted valid ID’s: employer or company ID, driver’s license, military records, passport and many others. The agency would also accept health cards, but remember that your Medicare card is not acceptable since it is not a health insurance card. Keep in mind that you are dealing with an agency of the sovereign government, so you are assured that all of your documents and personal information are kept in strict confidentiality. As soon as you filed your application, your SSN will be done in a few days and your record will be updated on the secured database of the government. 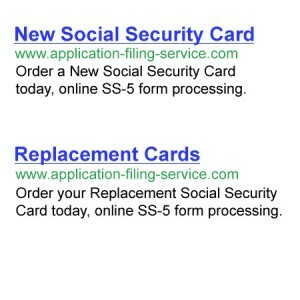 Social Security Card Application Online can be found at Application Filing Service.